Most audiophiles — the ones who have excellent hearing and put enormous value on the highest possible sound quality — usually loathe MP3 and other compressed audio formats because they remove some information from the digital files to spare some space. It is indeed true that these formats delete information, and it hurts everybody who loves music. Certainly, iTunes is a popular Mac OS application. It is an audio player with which we use it to manage our Apple devices like iPhones or iPads so that they have some music to play, films to watch or even game apps to play. iTunes is not the best music app. However, lots of people don't know or don't want to know other players which in some ways might be even better than the one discussed. Have you ever thought that what Apple offers as default is far from the best solution for experiencing the best sound of your favorite songs? Do you think your tracks can sound better? Sure thing they can! It's not about the hardware you have; neither about the audio engine built into your Mac. The secret is way closer than it seems. Most present-day music players cannot and most likely will not be able to play Hi-Res audio formats. Therefore, we cannot fully appreciate the sound as it was recorded in a studio. What music formats are there? We can roughly divide all music formats into two categories: lossy and lossless. Lossy music is compressed, i.e., it sounds like some parts were removed and now it lacks some tunes. It's like take a sentence and then remove each third vowel. If you just read the text, your brain will just fill in the blank, no problem. But is it the same as the original vibe you could get? Compressed formats include MP3, AAC, OGG Vorbis and others. Lossless sound is different. Why? Because they preserve the original sound and the music is deeper and complete compared to lossy. In case you want to know more, you can read about that famous rivaIry - FLAC vs. MP3. Lossless has all the data, and as a consequence, the quality of the playback is way higher. But if it clearly sounds better, where's the trick? Today we are proudly presenting you a brand-new music player for Mac. Developed by Coppertino Inc., the player is aiming to change the world so that everybody listens to High-Quality music. It holds a well-earned first place among audio players for Mac as well as iPhone music apps. Android and Windows versions are currently being developed so be upset – you will soon be able to use it. 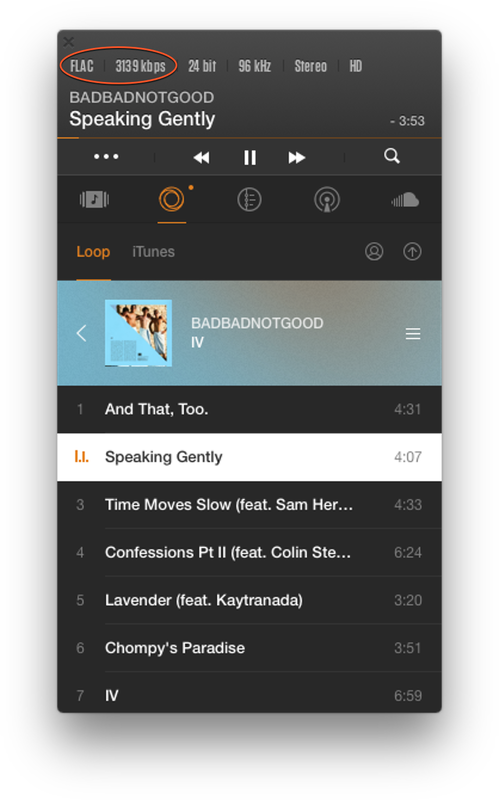 Why is so special about VOX Music Player for Mac & iPhone? The answer is very simple. It is an easy yet powerful audio player with an intuitive design so even a kid can manage it. The playback is at the top of imaginable as there are no restrictions to the formats (you can play both lossy and lossless). The new audio engine with bass-enhancing technology makes you believe that artists are playing just for you, your intimate solo concert. Unlike most music players for Mac, all you have is a small window with your collection, and that's about it. The compact interface does everything you need, but it doesn't waste lots of space. In the sections, you can access everything you'd expect from EQ to Last.fm support, but none of it stands in your way if you just want to listen to music. We do understand that Hi-Res music takes up a lot of space on your computer. For this reason, the developers built an unlimited cloud for all your music collection. It's called VOX Music Cloud Storage. No more external HDD, poor quality streaming services or hideous NAS. Whatever music you have or might have in the future – VOX Cloud can store all of it. The main feature of VOX Cloud is that it syncs your music libraries so whatever you have on the cloud you is automatically in VOX. As you understand, it is available for VOX users exclusively. It is a perfect music player for music lovers, average listener and anybody appreciates the quality and functionality. Star using VOX Cloud today. Create VOX Premium account. VOX uses internet data to stream from the VOX Cloud (formerly LOOP Unlimited Music Cloud Storage), but no song is compressed. If you uploaded 3000 kbps 96 kHz FLAC, that's exactly what you are going to hear, unlike, say, Soundcloud that convert whatever you upload to MP3 128 kbps. Another great feature is that any time you might not have internet data you can download some songs or album to listen offline. Besides, you have 30,000+ radio stations, SoundCloud stream, and customizable equalizer. The equalize has many presets for various genres, but you can always create your own set according to your sound preferences. All this proves that VOX is the best audio player for Mac. The era of mediocre music players is gone, and now it’s high-time you tried VOX Music Player for Mac & iPhone. It supports all the formats, syncs music libraries between Mac and iPhone, scrobbles to Last.fm and provides the best playback having a new bass-enhancing technology. Combined with VOX Music Cloud Storage, it makes a perfect solution for all music lovers who prefer a high-quality sound.